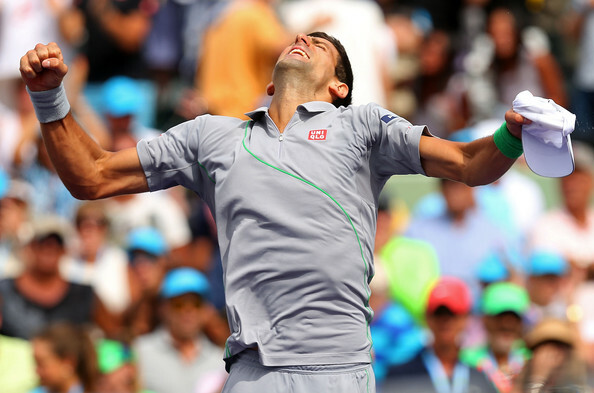 Novak Djokovic produced an absolute flawless display of tennis as he defeated the World No. 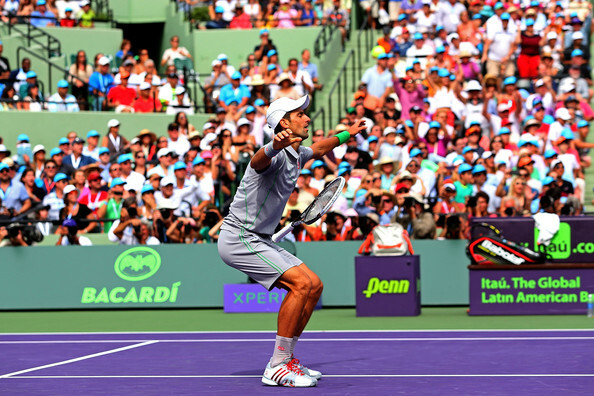 1 Rafa Nadal 6-3, 6-3 in 1 hour & 24 minutes to win his 4th Miami, 18th ATP 1000 Masters & his 43rd career title. With this win, Djokovic became the only 2nd man in the open era to twice win Indian Wells & Miami Masters in the same year. Roger Federer had achieved this feat in 2005 & 2006 & Djokovic did it in 2011 & now, repeated this feat in 2014. 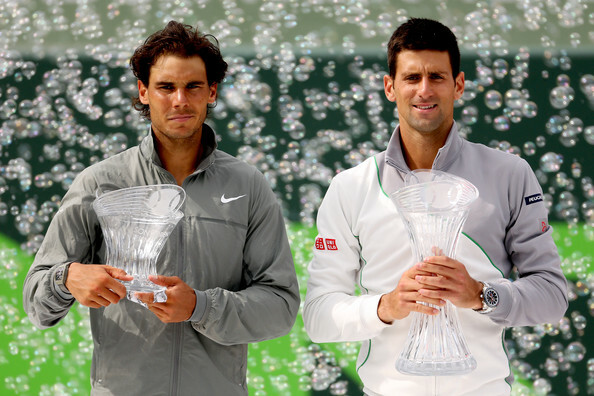 Also, this is for the first time in Open Era that only two players : Novak Djokovic & Rafael Nadal hold all of the 9 ATP-1000 masters title & season ending World Tour Final between them. 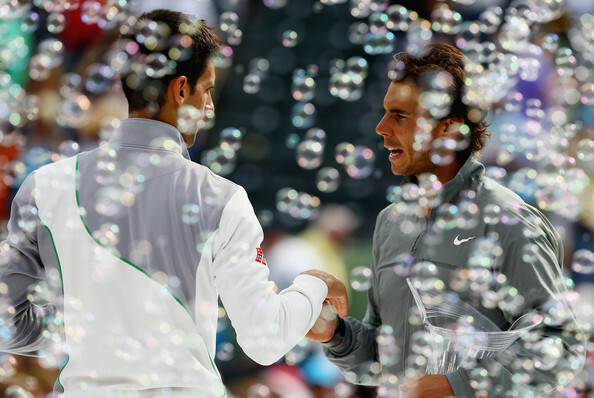 The gap between Nadal & Djokovic has narrowed to just 1920 points. Though, inspite of this loss, Rafa Nadal who is completing 128 weeks at ATP Number 1 tonight is assured to be #1 for 6 more weeks, at least till the end of Mutua Madrid Open, 2014 which will take his weeks at Number 1 to 134 weeks. Also, Roger Federer will be back to No. 4 after 264 days. After losing out in the 2nd Round of Wimbledon, 2014, Federer has been out of Top-4. Tomas Berdych will equal his career high ranking of #5 and same is the case with John Isner ( #9) & Milos Raonic ( #10). 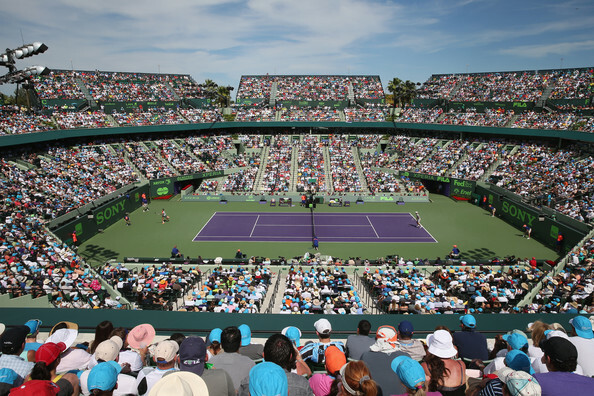 Read more about the ATP Ranking changes through out this Sony Open Tennis, 2014 week right here. Rafa started strongly & had break point on Djokovic's opening service game, but Djokovic played an absolute flawless match after that. 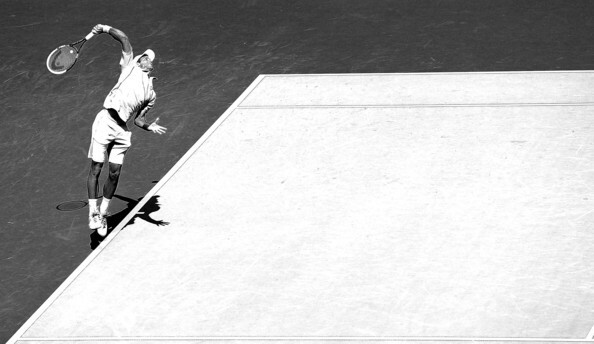 He didn't face a break point & was able to consistently put pressure on Nadal's service. Djokovic backhand looked in absolute prime form & the quality of ground strokes was just majestic. 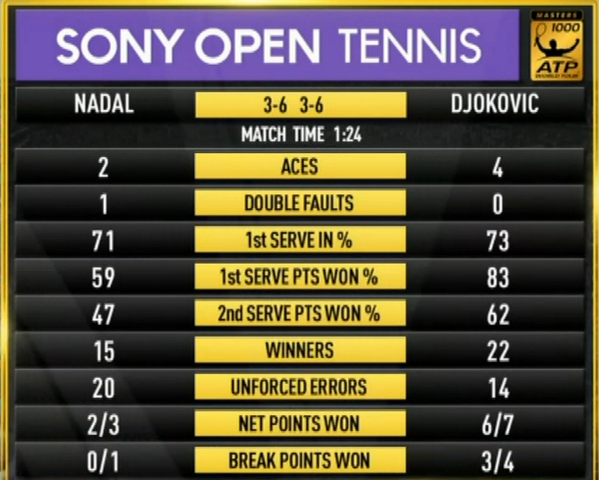 Djokovic broke Rafa's serve in the 6th game to get to a 4-2 lead. That one break was enough as the World No. 2 won the 1st set 6-3 in 39 mins. 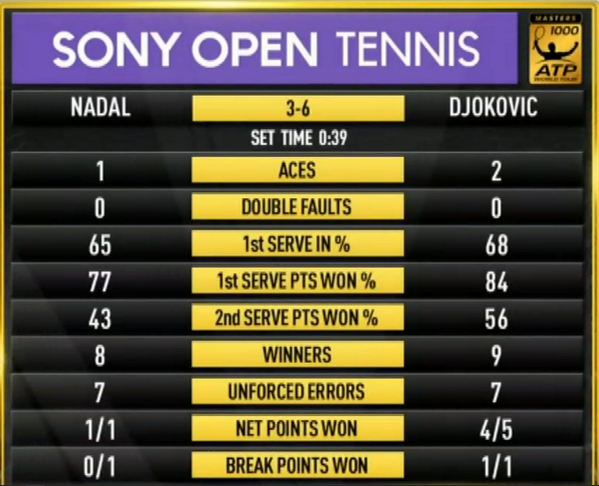 Djokovic broke Nadal's service in the 3rd game with two quality backhand down the line shots & mix of slices to get to a 2-1 lead. This was Rafael Nadal's 4th final loss at Miami. This was Djokovic 18th match win over Rafael Nadal. The Spaniard still leads the head to head 22-18 over the Serb & these two have played the most number of the times in the open era. 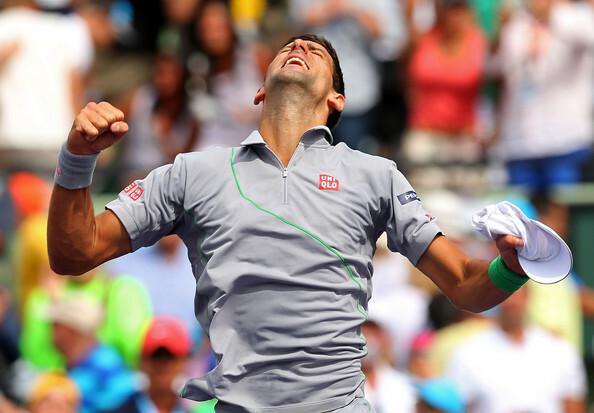 Also, Novak Djokovic became the 3rd most successful player in terms of ATP 1000 masters title wins. 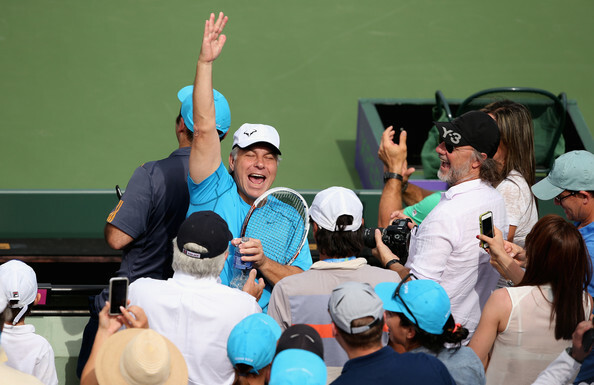 4th- Andre Agassi 17 master title wins. Scroll down for more pics, video highlights & more insights from the match. 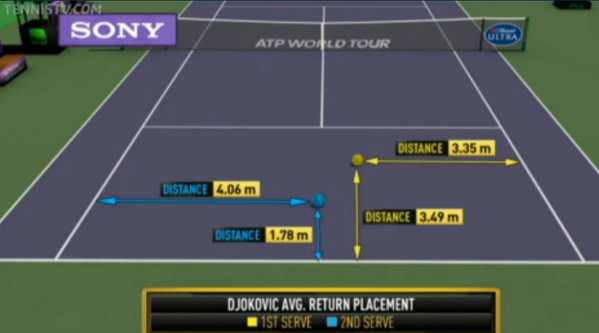 Djokovic is at the height of his career. To me, it seems Nadal is slowing down a bit. Seems Novak played his best. 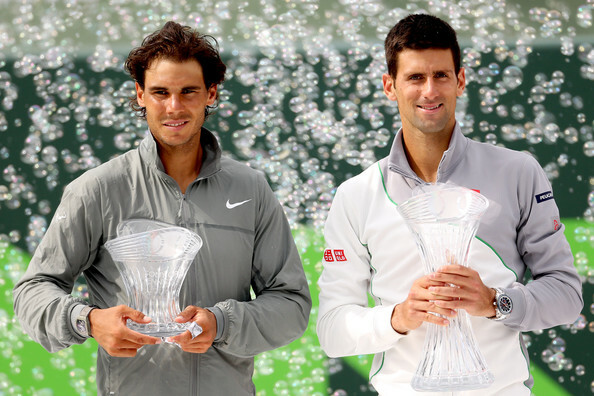 I am glad to see Roger,Rafa and Novak Era.